Stepping stone. Black sheep. Red-headed step-child. Low security space in EVE Online has been called all these things. Stereotypically highsec fears it, nullsec looks down on it (wormholers are clearly too busy making money to care) and all the destruction charts in the world cannot get EVE mainstream media to cover it with anything more than the occasional article or report. One can’t help but wonder; is lowsec suffering from an identity crisis? It can be strongly argued that CCP’s idea with security status when EVE Online originally came about was to provide tiers. Players would start in the relative safety of highsec, pay their dues in lowsec and finally spread their wings in nullsec. But just as many other things in EVE, it did not quite turn out as predicted. What has transpired over the years is that the ‘tiers’ have developed their own cultures. Especially lowsec. A considerable amount of players follow the intended tier system, often skipping lowsec altogether. Others have found their own ‘endgame’ in lowsec PvP culture and community however. What was perhaps originally intended as a stepping stone has developed a life of its own, with a very strong sense of self and virtues that define it. It can be argued that the ‘problem’ lies herein. The lowsec community has long since evolved, especially after the introduction of Factional Warfare, but the infrastructure that supports it has not. Sugar Kyle: In May of 2013, after going to Fanfest I started to define some basics of the problem as the very old infrastructure that Eve was built upon. The concept that low sec is a middle ground between high sec and null sec can be found in many places. I disagree that low sec is a mid point leading the player to null sec. I have disagreed with that from my earliest days and I believe that the players have turned it into its own environment. Lowsec has fostered a PvP style unlike any other area of New Eden. Regularly putting the rest of EVE to shame in kills and providing an endless stream of action. It is one of the main pillars from which lowsec derives its identity. But it does this at great cost, and it is a testament to the player created culture that this world within a world manages to persist. Because life is hard in lowsec. It is by far the most hazardous area of EVE to make ISK in, yet it offers marginally more than highsec and infinitely less than nullsec. Even Faction Warfare, although at times rather profitable, is an unreliable source of income. It is also only serving roughly half the population of lowsec, along with those that come simply to exploit the system. Funky Bacon: One of lowsec’s biggest problems is that it’s painted as some sort of middle ground between high and nullsec. It has mostly the same stuff, just a little bit better than high and a lot worse than null, except for one thing… the risk of operating in the area, especially around the FW zones given a very dense population of people looking to shoot other people. Outside of FW it’s given a very middling offering of rewards for Eve’s basic PVP opportunities, yet no PVEer in ther right mind would bother because the risk involved in capitalizing on it far exceeds most areas of nullsec offering greater rewards for less risk. So what is the solution? Sugar Kyle brought up her ideas with CCP Masterplan at last year’s FanFest. Sugar Kyle: The removal of static complexes removed a lot of lower end PvE content. I decided not to open the argument about the farming of those complexes. After all, I am not the one with the metrics. Instead, I argued that if farming was the problem with the static sites why could we not have them back as regular exploration sites? That without these lower end complexes, low sec had sites that required mid level skills and ships to complete. Here we are encouraging new players to not stay in high sec but explore all of the options in the game and decreasing the methods that they had to thrive in that environment. That didn’t sit well with me. When CCP finally responded about the removal of the static complexes in low sec there was an admission that they did not know how we had used those sites. What this suggests is that perhaps CCP have lost touch with what lowsec really is today. What was perhaps intended to be a part of the master plan (pun intended) towards null has developed into a very distinct state of controlled chaos that many players call home. Funky Bacon: What low sec really needs is a separation from highsec and null sec more in line with how Wormholes are their own game. I don’t mean we need to be lost in space all the time, what I mean is more unique drivers to lowsec. Resources and goods that are both valuable, and can only be obtained there. We got a taste of that with Tags4Sec, and there is FW. FW still needs some tweaks and fixes, but those pale in comparison to the rest of lowsec activities being next to worthless when the risk is considered. 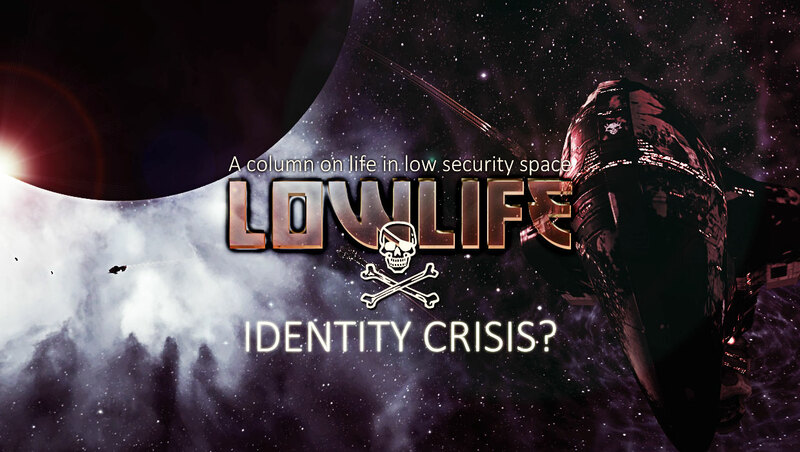 So is lowsec suffering from an identity crisis? No. Quite on the contrary, lowsec has a very strong sense of itself. The real question is; does EVE have a sense for the identity of lowsec? I leave you with some closing comments from Funky Bacon and Sugar Kyle. Funky Bacon: So yes, let’s get away from the misconception that Lowsec is some kiddie pool, or stepping stone. Let’s get away from low sec space being worth less than just about anywhere in Eve if you’re not part of FW, and lets get some more valuable unique lowsec only content, resources and tools for the players to compete for. We don’t even have to reinvent the wheel here. It might be as simple as adjusting loot being dropped in explorations sites, and some unique asteroids, and PI goods. Sugar Kyle: Whatever CCP does for low sec I wish for them to do with an understanding of people who live in low sec. I don’t want them to ignore the player base who has devoted their game to low sec and make changes without taking the denizens into consideration.